Soil and climate: Good topsoil, clay base. 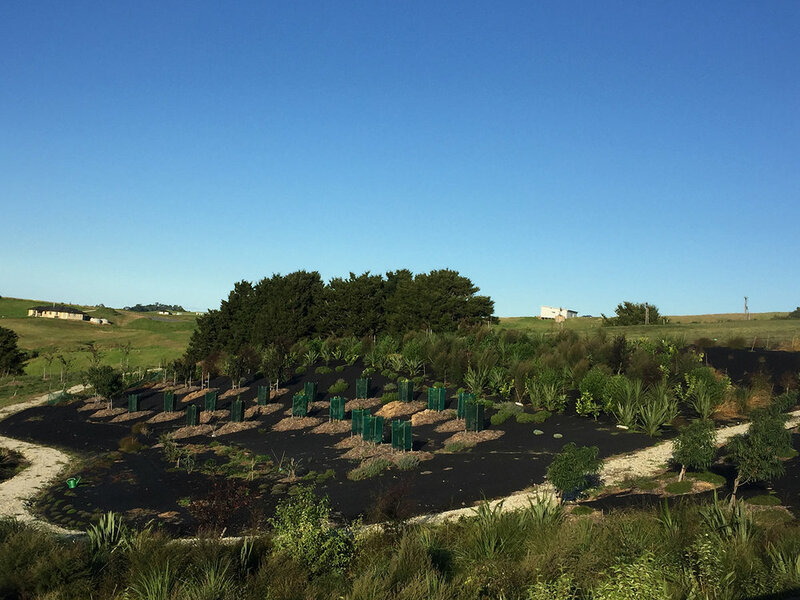 Pests and weeds: Kikuyu, ex-farm, gorse and thistle, ink weed, rabbits. Client wanted a large private garden that she would be able to enjoy for the next 30 years. She wanted a low maintenance property with an emphasis towards orchards, avenues and specimen trees. She wanted to create a park like feel. She is an avid gardener, loves her roses and perennials and watching things grow. It has all happened very quickly with growth from the natives up to head height in 1 year. This is an ongoing project with many more exciting ideas to come. 1. 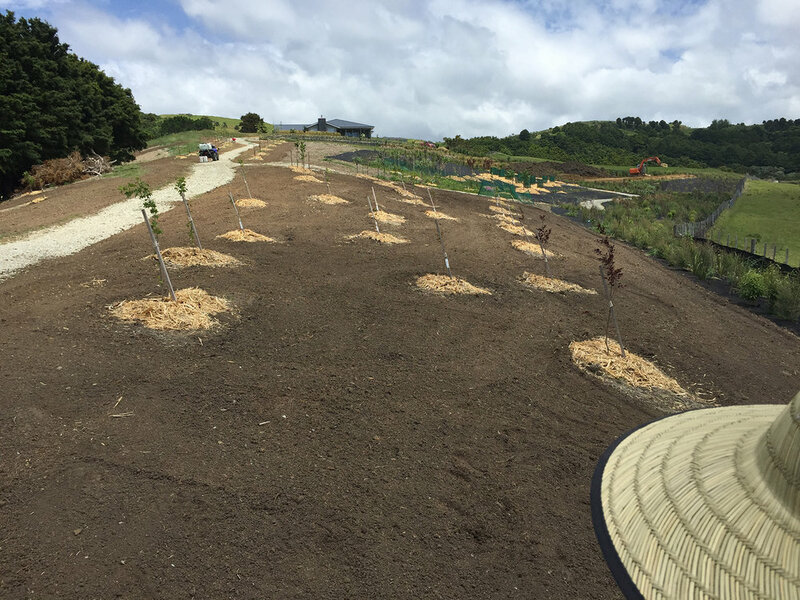 The first stage was to create a terraced north-facing orchard with rows of fruit trees planted on the terraced mounds. 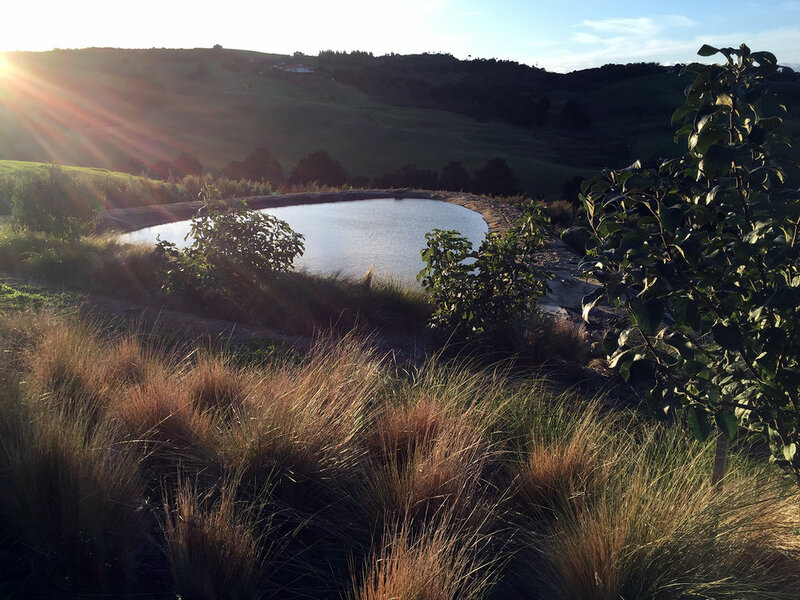 It is under planted with native grasses such as carex virgata, poacita and carex testacea to capture the wind and light. We used this method as low fertility living mulch. The rows were made 7 metres apart to allow access for farm vehicles come maintenance and harvesting time. The western boundary was planted at the same stage to shelter the orchard from the predominant south-west winds. We used all natives with a mixture of colour and added fruit trees such as guava, peach, plum, almonds and feijoas to feed the birds and the occasional passer by. 2. The second stage was to create a feature landscape directly in front of her new house. 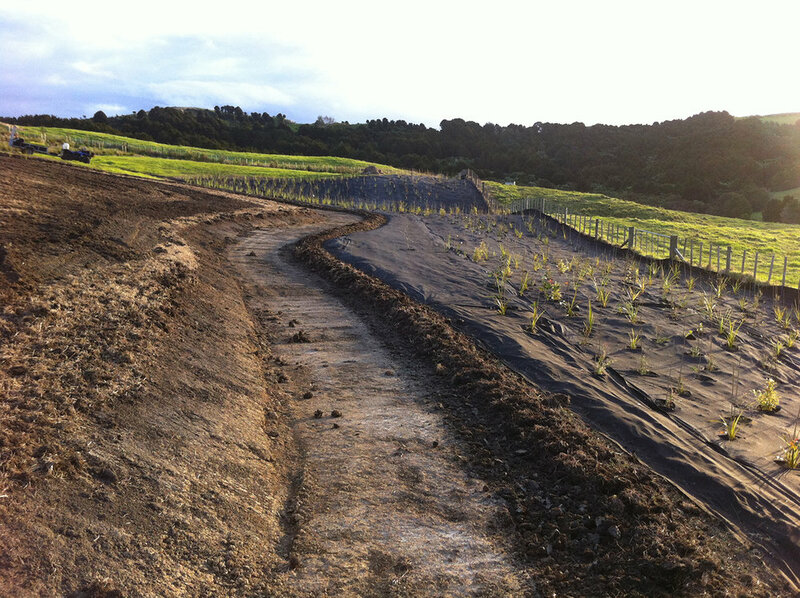 In this area we used poacita x 700 to mimic the Mangawhai sand dunes in the horizon. It’s beauty and easy care brings interest to the eye close to home. We then in-filled the area with sand, which invited skylarks to sing high above. Two years on this is quite a picture, the grasses are a talking point from family, friends and visitors. 3. The next year: We continued through to the rest of the property. 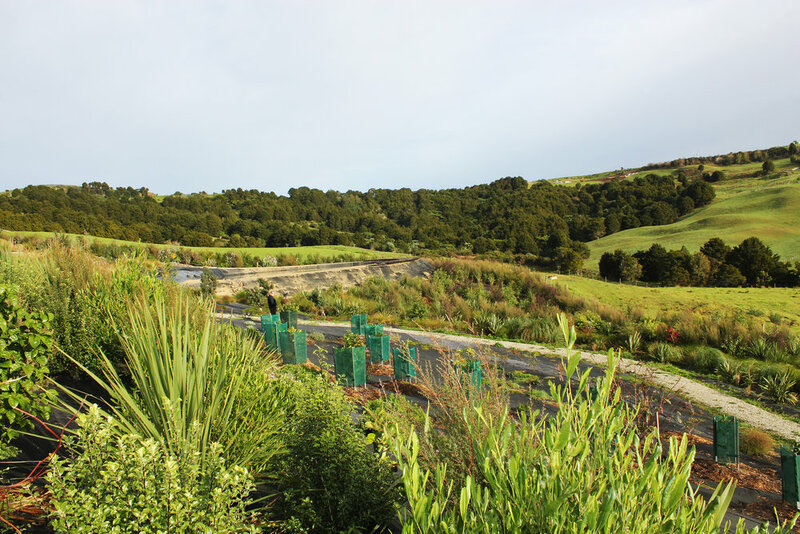 The design was based on working with the contours of the land to create a journey throughout the park for farm vehicles and people and needed to lead to all areas. The water tables were most important to work with and culverts were placed in area’s needed. The whole drive was metalled with a mixture of lime and blue rock. 4. 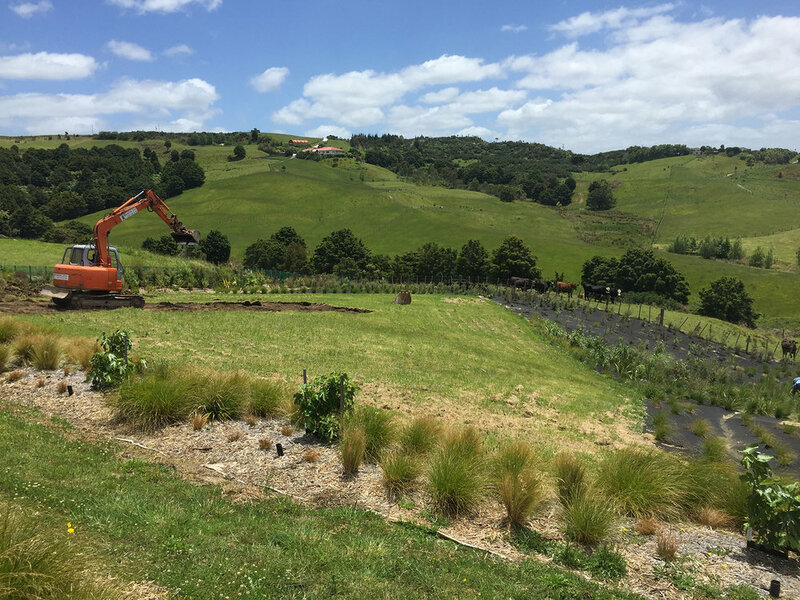 With the orchard and feature garden complete we were able to focus on the next stage of the property which was a rolling north facing kikuyu paddock. 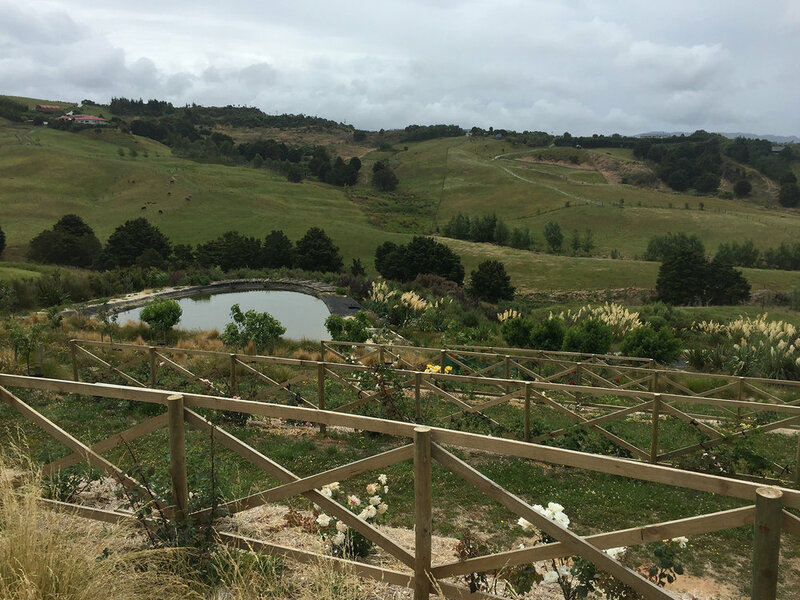 This needed to include a micro climate for the citrus, areas for the specimen trees that will in 20 years time be very big, an avocado grove, a pear avenue, a perennial Pier Ordolf garden and a much anticipated rose garden. 5. It started with spraying the whole boundary before cultivating, giving us a 4 metre strip to plant our mixed native belt. 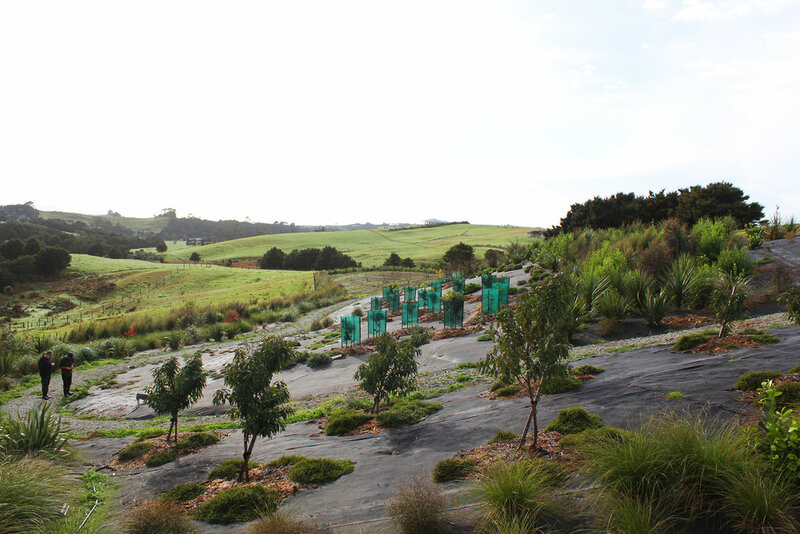 This resulted in more than 2500 natives with added specimens like nyssa sylvatica, persimmons, pururis and pohutukawas in the mix. 6. A suntrap was created with all the excess soil from the access ways to create a warm microclimate for the fruit trees such as citrus, apricots, peaches and blueberries. The suntrap shelter species consisted of some 15+ different species of natives to fill the slope of the suntrap. Ground covers are establishing on this hot bank. 7. 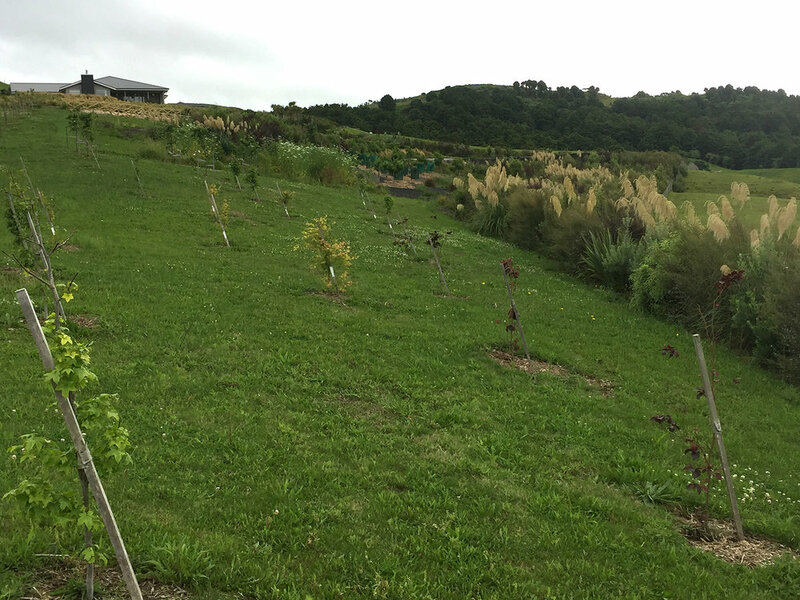 An avocado grove has been established in the sheltered area beyond the totaras, which was once a gorse slope. A digger with a roller was used to clear this area. The bank is now used as the grey water drip line field with a blanket of ground cover species like meuhlenbeckia astonii, coprosma poor knights, carex virgata, carex testacea, poa, tecomenthe, grevillea bronze rambler. This bank will have a boardwalk running down it to gain walking access to the avocado area. The avocados were planted on large topsoil mounds to help with the longevity of the taproot that avocados have. They are looking really happy in their 2nd year. 8. We designed and constructed the swimming pond. This was an important focal point of the garden, we wanted to use up as much of the space we could to achieve this. 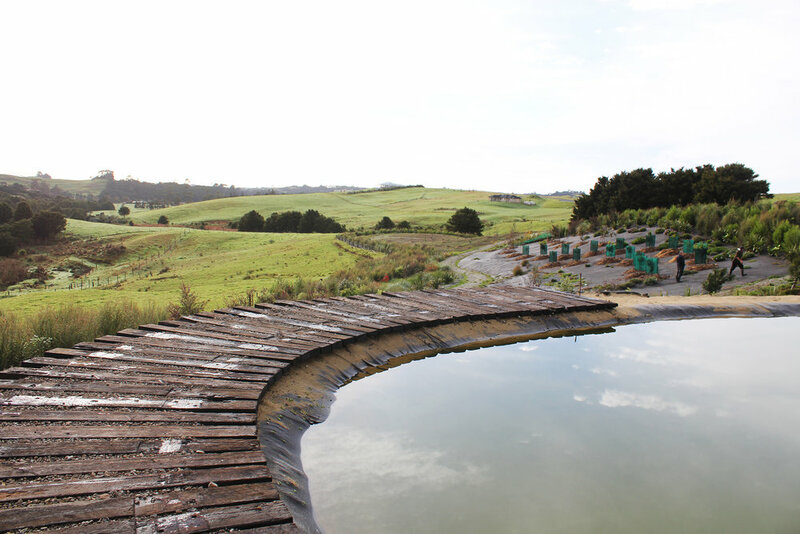 Thanks to a skilled digger operator, we have gained a wonderful teardrop shaped infinity pond. 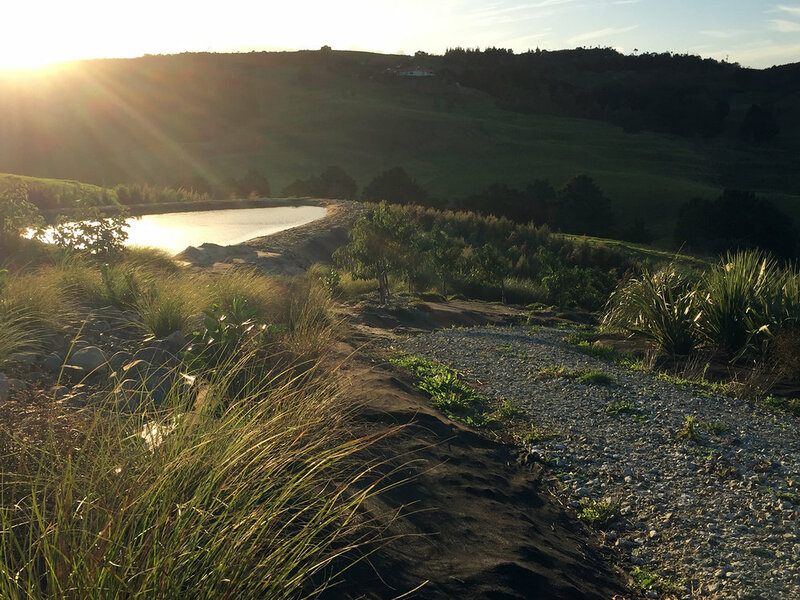 With our specifically designed tea bag system, we can allow planting all the way around as well as in the pond itself. 9. 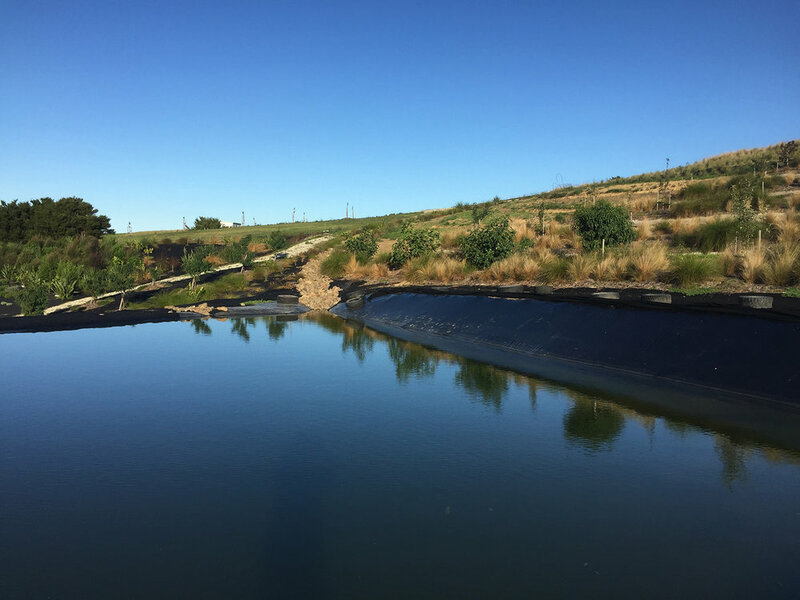 The next area to tackle was to re-create a dry riverbed system to capture excess rainwater to divert to the teardrop pond. The same was done on the opposite side of the orchard to capture the storm water and tank overflow coming off the driveway around the house. 10. The sleeper boardwalk is under construction, this will go around the entire pond with pebbles in between. The pond has exceeded our expectations and feels like a lake to swim in in, hot on top and cold down the bottom. We will continue working on this through the summer months with plantings and hard landscaping. 11. Next was to spray out the areas of bare ground between the pear avenue, around the amenity trees, birches and the avocado grove. We cultivated the ground and sowed hard fescue seed with a nurse crop of rye. This is our new ongoing project to establish an entire no mow area of fescue. The rye is the nurse crop, which was sprayed out once at the desired maturity leaving the underlying fescue to develop. It looks great and we’re looking forward to the green waving carpet throughout the place as years go on. The fescue gets to a height of 6 inches and stays there. It is slow growing and is always green and allows for additional plantings within it like bulbs and wildflowers. 12. We then began concentrating on the rose structures. Our client wanted an English garden. We terraced the designated areas and constructed a simple post and cross rail fence system that provides support for the roses and adds structure to the whole garden. The post and cross rail fence continues down into the pear avenue to divide the bank from the top drive where roses and wisteria were planted. 13. There were 8 raised beds installed and leveled for the vegetable gardens. They were filled with topsoil and compost. So much produce has come out of these beds already. A wall is to be constructed on the driveway separating and sheltering the garden in the future. We have a few projects going forward - to construct a big pergola system from house to garden and one from bottom road leading into the avocado area.